Upgrading to a wireless system comes with many benefits not only to your patients, but to your staff as well. This advanced technology will allow a patient to quickly alert staff, while providing the same robuts features as a wired system. Wireless systems can integrate several devices into one and ensure each patient call is being delivered directly to the appropriate person. Upgrading to wireless technology will provide your staff with the flexibility to move freely throughout the facility while remaining accessible to the population. Overall, moving to a wireless system will increase efficiency in your nursing units. You invest in your care facility. Increasing staff to accommodate new patients and developing new units or wings ensure you’re taking the right steps toward next-level patient care. Wireless systems allow for easy expansion of your alerting systems at a reduced cost,compared with their wired counterparts. Furthermore, adding up to date technology in your new units or wings will ensure upgrades down the line become more efficient and less costly. This one may sound like the most obvious but, often, updating a nurse call system can be low on a care facility’s priority list. If the existing system is functioning, the need to replace it is not urgent. However, if you’re technology is outdated, or soon will be, you’ll be paying for it with pricier repairs down the line. There’s no time like the present, so increase functionality and stay up-to-date with your client’s priorities. 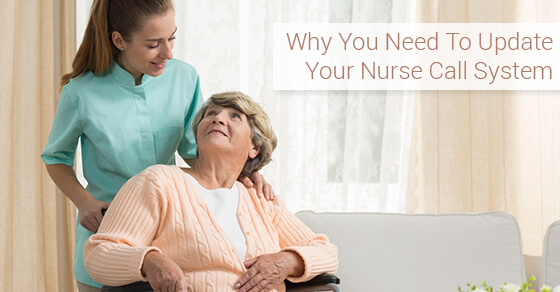 Overall, updating your nurse call system not only keeps your patients happy, but also your staff. An advanced nurse call system will assure patient’s needs are attended to, while your staff are provided flexibility and enhanced communication. If you’re unsure if an upgrade is right for you, keep these above reasons in mind.